Nate has a broadband internet connection, and ever since he got it he has been singing its praises. Apparently it's a little faster than a dialup connection. If you have it, you can do stuff like download the entire 18-hour Dune special edition in the same amount of time it takes you to realize you don't want the entire 18-hour Dune special edition, which is no time. Meanwhile, on my dialup internet service, I'm chugging along for 12 hours just to download "Convoy." Besides the speed, another advantage of a high-speed connection is that more than one person in a household can be online at once. No longer need Laura and I take turns going online to post lies about each other on the message board. We could join Nate in his high-tech paradise, in which he has 6 computers online at once, all running different operating systems, and from each of which he instant messages me simultaneously with mocking messages about my online connection, appearance, posture, and general demeanor. As is no doubt painfully obvious at this point, I finally decided to give in and get DSL. I called my telephone company and asked them to hook me up. "Sorry," they apologized insincerely, "we don't offer DSL in your area." Let me tell you a little about my area. It's true, I don't live in one of the 5 biggest cities in the US. I don't want to name the city specifically, in case those nasty college loans people might be reading, but I will say this: there is (or was until recently; I don't keep track of these things) a popular NBC drama named after my city. The Farrelly brothers have made no fewer than 60 movies which have its name in the title. And I live off one of the major streets of this city--a street that fans of slapstick toilet humor and hankie-summoning melodrama alike must have seen in scores of establishing shots. The phone company hasn't gotten around to running DSL here. Now let me tell you a little about the place where Nate, Mr. "I have DSL and my roommate has a cable modem" lives. I don't think I'm giving away the identity of his city when I tell you that its name is "Woonsocket." You may have recognized that name from its not ever being a popular NBC drama. "Woonsocket" is an Indian word which means "Thundermist," which is an English word which means "Let's move from this place. It smells like poo." Swallowing my disappointment, I admitted to myself what I had known, deep down, all along. If I wanted high-speed internet access, I would have to let Cox into my home--something I was understandably loath to do. 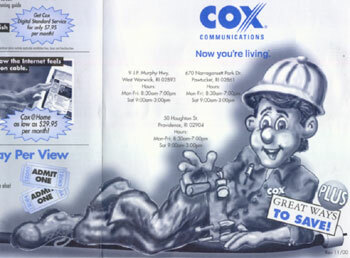 As a refresher, here's the Cox mascot. But, as they say, "must needs when the devil drives," an expression which would perfectly describe my situation if I were a chatty manservant who lived in the 1400's. If such were the case, I would also refer to my choice of Cox as "Hobson's choice" and say, perhaps most enigmatically, that "he who sups with the devil must have a long spoon." So I called Cox. Initially, everything went well. We discussed installation fees, continued cable service and networking options. Then the operator uttered a sentence which should have warned me to hang up the phone right there. "Would you like the good news or the bad news?" I opted for the bad news. "Excite @ home, the company that will be providing you with the internet, recently filed for chapter 11." Now, I'm not an economist, and neither was my operator, but Chapter 11 sounds bad. I think it's the one which begins, "In Which Excite @ Home Goes Bankrupt." I tried to get a synopsis of Chapter 11 from the operator, peppering my questions liberally with Wall Street terms like "Adam Smith," "the law of supply of demand," and "laissez faire economy." However, I didn't get much more information. During the remainder of the conversation, the operator carefully avoided uttering the word "bankrupt," although it is worth noting that she did slip a lot of times and come steadily closer and closer. "So let me paraphrase this bad news," I said. "You can install the cable to my house. You can plug in my modem and make sure it's on. But it's unlikely that there will be any sweet internet goodness ever dripping into my computer." "That's pretty much the size of it." I never asked what the good news was, but I reasoned that the bad news was sufficiently bad that the good news couldn't make up for it, unless it was something fundamentally unrelated to me getting Cox @ home, like, for instance, the reverse of getting Cox @ Home, or perhaps that the "Don't Give Paul a Million Dollars Foundation" was filing for Chapter 11 as well. There is another option besides cable and DSL, of course... I could get a satellite modem. They're excusively used by spies, however, and part of the service agreement is that FBI guys can legally kill you for no reason. So this is where things stand. I'm stuck with a stupid old 28.8 dialup connection. The Farrelly brothers are coming out with a movie with "Woonsocket" in the title. And for now, at least, I can't perpetuate the abuse of copyright law by downloading it off KaZaA. I'll have to rent the video and duplicate it like everybody else.